Home»China-like Tableware»Embellish Scroll Clear Plastic Plates BLOWOUT!! CHECK OUT THESE GREAT PRICES ON PLASTIC SCROLL PLATES!! STOCK UP NOW FOR ANY PARTY OR FUNCTION!! Embellish 10" Clear Plastic Scroll Plates 20ct. 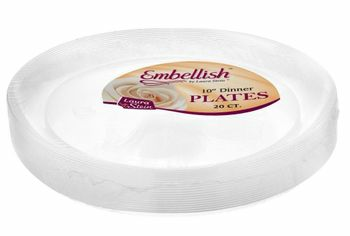 Embellish 9" Clear Plastic Scroll Plates 20ct. Embellish 7" Clear Plastic Salad Scroll Plates 20ct. Embellish 6" Clear Plastic Scroll Cake Plates 20ct. Embellish 10oz. Scroll Plastic Bowls 20ct. Embellish 6oz. Scroll Plastic Dessert Bowls 20ct. Embelish 6oz. Scroll Sundae Plastic Bowl 50ct.